Step 3 involves making depressions for the control sticks and the fuel gauges. My depressions for the fuel gauges are a bit different since I am using the Vance Atkinson gauges. The electrical channel is also made at this time though I actually did it a bit earlier. 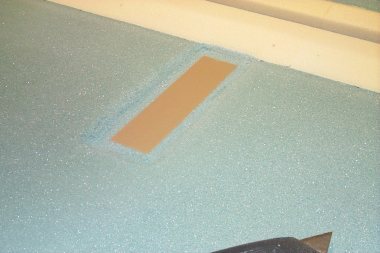 All the foam is smoothed in preparation for step 4. February 17, 2000. After checking the mailing list archives I confirmed that there may be a problem. the 14.5" dimension puts the channel in the way of the rudder pulley. After checking drawings M-7 and M-8 I verified that it should be 14.7" from the top edge. This is what others said in the archives. Making the channel was easy. Are marked the line at 14.7" and 1.25" wide. The real question was where to put the slope. I chose a long, gradual slope. 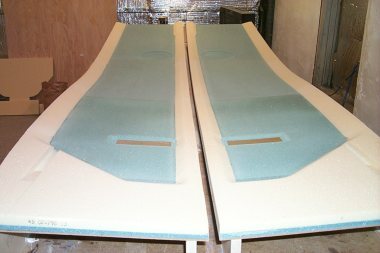 The aft edge of the slope starts 6" from the aft edge of the fuselage and slopes for 3.75". Fairly arbitrary but I verified the slope won't interfere with LWY. I used a utility knife to cut the sides of the channel and I used a 1" wood chisel to make the slope. Worked very well. February 20, 2000. Here is the 8" diameter control stick depression. It is 1/4" deep. I cut a small, round wood block and rubber cemented a piece of sandpaper to it. This worked well but made a heck of a mess. I made good use of the shop vac while making these. The biggest problem I ran into was the seam in the foam near the edge of the depression. If the seam was 1/2" further aft things would have been better. Keep this in mind when joining the foam in step 2. February 20, 2000. I chose to make the fuel gauge depressions flat since I am using Vance's fuel gauges. The slanted depression isn't needed. The depression isn't really needed but it will allow the gauge to sit flush with the side which will look much better. You can see the box tape in place. It is much narrower than the plans state since this will not be used as a window. 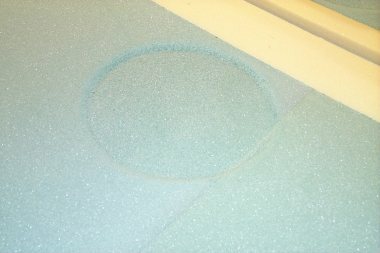 I only need to remove enough foam later to get to the holes in the gauge. The only issue I had was that Vance's instructions state that the bottom of the gauge base should be 9.15" inches from the top. This corresponds with the bottom of the fuel tank as derived in chapter 21. Vance's instructions also state that the bottom hole in the gauge base should be as close to the bottom of the tank. The hole is 0.8" from the bottom of the gauge base. These two instructions conflict a bit. I wrote Vance and he suggested making the depression long enough to adjust the location of the gauge later to get the hole on the best place. February 20, 2000. Due to the twist in the fuselage sides from the aft jigs being different heights, I ran into a problem with a non-uniform gap between the two sides along the top edges. 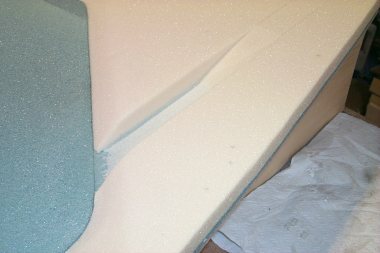 The masonite is spaced properly but the foam wasn't. My solution was to simply wrap a block of wood of the proper thickness and sand both foam edges at the same time to get the proper, and uniform gap. My gap is 3/4" instead of 7/8". I'm assuming that this is not a problem as long as the gap is uniform. February 20, 2000. Here are the sides at the end of step 3. All the foam is in place. The depressions are made. The gap between the two sides is uniform. The longerons have been test fit and should go in place with little effort. 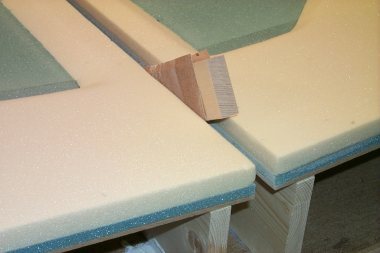 All the foam has been sanded smooth and corners have been rounded (except for the electrical channel).